Hotel del Coronado's bundle-up holiday favorite readies for its annual return. 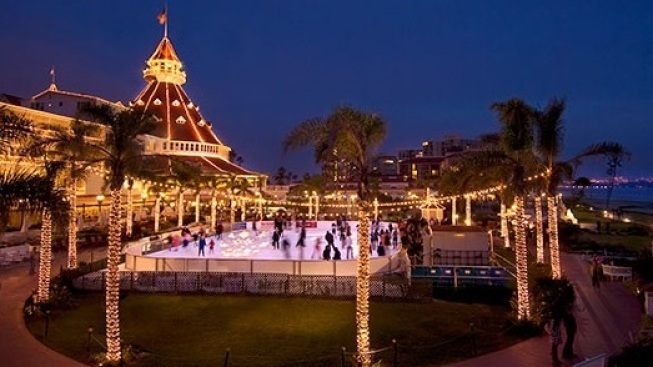 A turret, a rink, the Pacific: Hotel del Coronado's Skating by the Sea opens on Nov. 26, 2015. WATER INTO ICE: If you had to take a plastic bucket down to the Pacific Ocean, say, the kind of kid-cute bucket you get at a discount store, and start filling it up with water, how many trips back up the sand would you need to make to build, then freeze, an ice rink of notable size? Call this more of a hypothetical question, or a query to debate with your pals as you pirouette together between the Hotel del Coronado and the wide, wide ocean. Nope, that's not how the annual ice rink at The Del is made -- the ol' bucket-back-and-forth-from-the-ocean might take a few weeks, or even months. But it is worth admiring two forms of H2O, side-by-side, one representing sunny 'n sandy good times and the other cooler climes. It makes for quite the visual each year when the landmark hotel of Coronado Island unveils its seasonal spin-around, and that unveiling is happening on none other than Thanksgiving Day in 2015. YEP, THE HOLIDAYS... are already in the works for many hotels, especially those historic destinations where Christmas trees and decorations and lights go a bit, well, over the top. Hotel del Coronado just made the announcement in mid-September regarding its annual Skating by the Sea rink, and its Nov. 26 debut. There's also a "Skate & S'mores" package to ponder, a deal that includes a stay at the hotel, a skate session that's a good long hour, and s'mores by a bonfire on the nearby beach, to make you nice and toasty after all of that ice-adjacent-ness. The much-photographed ice rink isn't the only gewgaw to sparkle upon The Del's proverbial tree come November and December; a Victorian tea, a New Year's Eve gala, and the famous lobby tree are all in the just-ahead works. The only question remaining is not the one involving the plastic kid's bucket and how much ocean water would be required to make a rink; it is whether you'll need to go full winter regarding your clothing or not. You may need mittens or you may be there on an especially temperate winter's day. Do they make a swimsuit/knit cap combo? Perhaps that's the best outfit for both ice rink and beach enjoyment.